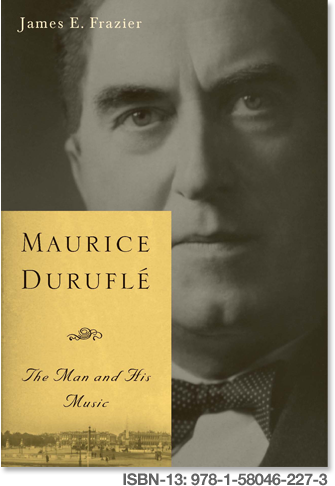 Maurice Duruflé: The Man and His Music is a new biography of the great French organist and composer (1902-86), and the most comprehensive in any language. James E. Frazier traces Duruflé's musical training, his studies with Tournemire and Vierne, and his career as an organist, church musician, composer, recitalist, Conservatoire professor, and orchestral musician. Frazier also examines the career and contributions of Duruflé's wife, the formidable organist Marie-Madeleine Duruflé-Chevalier. Duruflé brought the church's unique language of plainsong into a compelling liaison with the secular harmonies of the modern French school (as typified by Debussy, Ravel, and Dukas) in works for his own instrument and in his widely loved masterpiece, the Requiem Op. 9 for soloists, chorus, organ, and orchestra. Drawing on the accounts of those who knew Duruflé personally as well as on Frazier's own detailed research, Maurice Duruflé offers a broad sketch of this modest and elusive man, widely recognized today for having created some of the greatest works in the organ repertory – and the masterful Requiem. James E. Frazier retired from church music in 2013 having served for nine years as the organist and director of music at Saint John the Evangelist Episcopal Church in Saint Paul, Minnesota.